With the publication of her seventh novel, Someone, Alice McDermott enriches her literary tradition. While A Bigamist’s Daughter—her first novel, published in 1982—ushered McDermott’s writing into the world, it wasn’t until her second novel, That Night, that the acclaimed author established her unique style. That sophomore novel with its lyrical prose was a finalist for three separate and illustrious literary awards: the Pulitzer, the National Book Award, and the PEN/Faulkner Award for Fiction. Her mark made with That Night, McDermott has continued to delight with each subsequent novel. At Weddings and Wakes was published in 1992 and earned McDermott her second Pulitzer Prize finalist honor. Charming Billy followed six years later and won an American Book Award and the National Book Award. Her fifth novel, Child of My Heart (2002), earned an International IMPAC Dublin Literary Award nomination. Her 2006 publication, After This, garnered a third Pulitzer Prize finalist distinction. While McDermott writes consistently what she knows—cutting her last six works from the same cloth, 20th-century working-class Irish Catholic families living in the greater New York City area—she threads each time period and setting with such rich detail and seams together the characters’ narratives with such unique tragedies, that the lives she portrays come to life. It doesn’t matter if it's Brooklyn or Queens or Long Island during Prohibition, just after World War II, or during the Sexual Revolution of the 1960s. Each tale resonates deeply. That night when he came to claim her, he stood on the short lawn before her house, his knees bent, his fists driven into his thighs, and bellowed her name with such passion that even his friends who surrounded him, who had come to support him, to drag her from the house, to murder her family if they had to, let the chains they carried go limp in their hands. I had in my care that summer four dogs, three cats, the Moran kids, Daisy, my eight-year-old cousin, and Flora, the toddler child of a local artist. There was also, for a while, a litter of wild rabbits, three of them, that had been left under our back step. They were wet and blind, curled up like grubs and wrapped in a kind of gray caul—so small it was difficult to know if their bodies moved with the beating of their hearts or the rise of their breaths. Trouble piled on trouble, Monsignor thought, as he walked down the center aisle (grateful that this would be a quick and simple ceremony, no messing with candles lit at the end of every pew, as was so much in vogue these days, wax dripping everywhere). These aesthetic choices can alienate and there is some merit to readers’ criticisms—boring, slow, no plot, murky, unlikable or unknowable characters. However, I find McDermott’s novels might require a different litmus test, an out-of-the-ordinary literary rubric, if you will. When a literary novel falls short of its potential, there are numerous ways it could happen. This is because writers have so many elements—character, plot, point-of-view, setting, pacing, theme, dialogue, description, and voice—at their disposal that a novel can easily become cacophonous. To make an analogy, I think of these literary elements as musical components. Whenever a band goes into a recording studio, they often rely on a sound engineer to provide expert mixing. The engineer’s job is to create the best balance of the musical elements in order to create the desired sound: to highlight the lead singer, the lead guitar, the rhythm section, or balance the various elements to achieve the song’s purpose. Naturally, a band’s ballad will require different mixing than their mosh pit thrash tune. Literary fiction should be as mindful of what element it’s trying to showcase. There has to be one facet that serves as the novel’s foundation and provides continuity through the course of its narrative. This element—whether it’s the premise, the writing style, the plot and storytelling, or some other—must be amped up. To maintain proper balance, the remaining literary components must therefore be toned down. Style and storytelling, for instance, are two literary aspects that are in direct competition with a reader’s energies. A complicated, intricate premise cannot be paired with an idiosyncratic or florid style. The result is a muddled, overwrought novel. A simple or slow plot line with equally simplistic writing won’t work either; there is nothing at all to hold the reader’s interest. When authors find just the right combination of character, plot, point-of-view, setting, pacing, theme, dialogue, description, and voice; when they've amped up the elements that best showcase what the novel is trying to do; when they have toned down the aspects that compete with each other, or simply confuse or overtax the reader—when all of these factors come together, the end product can be sublime. And this superb achievement is what Alice McDermott manages in the majority of her novels. Her latest novel, Someone, is no exception. 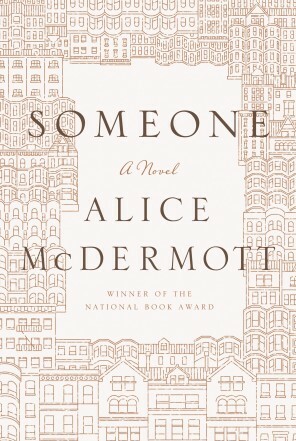 McDermott returns to the familiar—an Irish-American family living in New York. They are still strongly Catholic, though, as McDermott puts it, “...churches should have been the touchstone places of our lives, a pair of Catholics such as we were. But in truth it was the tiled corridors of these old urban hospitals that marked the real occasions of our life together.” The author also revisits a tried-and-true theme—a coming-of-age tale that doesn’t take place within the confines of childhood and the early adult years, but one that extends well into middle age. For Someone, the novel’s premise is simple—the ordinary life of Marie, a working class girl from Brooklyn. 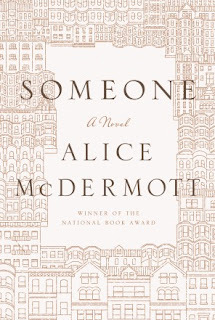 McDermott spans most of Marie’s life, from the time she is seven and awaiting her father’s return from work on the stoop of their brownstone apartment building to Marie’s old age complaints—a widow living alone, her grown daughters obligated to look after her when she has cataract surgery. Along the way, McDermott alights upon the significant and memorable moments in Marie’s life, most all of them tragic, disappointing, or confusing. “Who’s going to love me?” I said. The brim of his hat cast his eyes in shadow. Behind him, the park teemed with strangers. When Marie is able to perceive events clearly, she gains insight, “…ordinary days were a veil, a swath of thin cloth that distorted the eye. Brushed aside, in moments such as these, all that was brittle and terrible and unchanging was made clear.” At the end of her life, Marie realizes she is an amadan, a fool. Throughout Someone, McDermott persists with her own unique style and storytelling, striving for sublimity. As is the case with her other novels, this style is, as Marie herself reflects on the memory of her first love, “…by turns, devastating and thrilling…” As with her previous five novels, the author doesn’t disappoint her readers with bland descriptions of Marie’s ordinary life, but evokes each scene like a literary magician. And look, tore her stocking on something. She lifted her black shoe to the step where I sat and pulled back the long coat and the skirt. I saw the laddered run, the flesh of Pegeen’s thin and dark-haired calf pressing through between each rung. The nail of the finger Pegeen ran over its length was bitten down to nothing, but the movement of her hand along the tear was gentle and conciliatory. A kind of sympathy for her own flesh, which I imitated, brushing my own hand along the unbroken silk of Pegeen’s stocking, and then over the torn threads of the run. In describing Marie’s childhood apartment, a Brooklyn enclave of mainly first-generation Irish immigrants in the time of Prohibition, the author makes an otherwise mundane world rich by details. The apartment we lived in was long and narrow, with windows in the front and in the back. The back caught the morning light and the front the slow, orange hours of the afternoon and evening. Even at this cool hour in late spring, it was a dusty, city light. It fell on paint-polished window seats and pink carpet roses. It stamped the looming plaster walls with shadowed crossbars, long rectangles; it fit itself through the bedroom door, crossed the living room, climbed the sturdy legs of the formidable dining-room chairs, and was laid out now on the dining-room table where the cloth—starched linen expertly decorated with my mother’s meticulous cross-stitch—had been carefully folded back along the whole length so that Gabe could place his school blotter and his books on the smooth wood. In descriptions such as these, we see McDermott at her finest, in the literary cloth she has chosen to wear, that of the stylist. Again, her novels are cut from the same cloth; her plots are mere threads. The heft of her career, however, is in the intricacy of the finer points, the colors and patterns with which she embroiders her novels, as expertly decorated as Marie’s mother’s cross-stitch. Someone is the latest addition to the linen of McDermott’s literary work, extraordinary art woven out of ordinary lives. Sabra Wineteer grew up in Moss Bluff, Louisiana. She has since lived in England, New Zealand, Germany, Missouri, Tennessee, Texas, and currently resides in rural Pennsylvania with her husband of eighteen years and their three tweens. Her work has appeared in TWINS Magazine, storySouth, The Rumpus, 7X20, the anthology 140 And Counting, as well as other publications. She is on the editorial board of the Green Hills Literary Lantern and won the Joyce Horton Johnson Fiction Award.